While most doctors prescribe powerful hypertension drugs that cause numerous side effects, there is a simple way to reduce blood pressure and balance cholesterol levels, and it doesn’t come in a bottle. Celery has been used for centuries to treat everything from urinary tract infections to skin conditions, but it is most profoundly useful as a treatment for hypertension. This is due to its high concentrations of a substance called 3-butylphthalide, described by researchers at the University of Chicago Medical Center as a chemical that both reduces blood pressure by relaxing the smooth muscle lining of blood vessels, and purifying the blood of toxins. 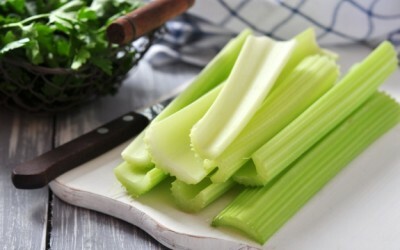 Eating or juicing just four stalks of celery a day prompts a decrease in both blood pressure and cholesterol levels. In addition to this health-giving benefit, celery is also full of vitamin C, fiber, and potassium, so it is a great post-workout replenishment. Celery is also 90% water so it is a very alkalizing food. During the Roman Empire, celery was fed to livestock to help de-acidify their diets. It also helped to cure the effects of feasting heavily, and was eaten the morning after a glutenous night of binging. One of your favorite pale green vegetables, celery (Apium graveolens), is even mentioned by Homer in the Odyssey in 850 B.C. and by Chinese healers alike as a powerful healing food. Celery has also been used by Dutch healers since the eighteenth century and Chinese herbalists since the fifth century. It is estimated that Americans spent more than 5 billion dollars on hypertension drugs in just the past five years alone. Celery is an inexpensive way to treat this disease without side effects that accompany drugs like Adderall or Celexa, Cipro, and Hydrocodone. Why would anyone want to suffer from nausea, dizziness, loss of sexual appetite, light headedness, insomnia, and other unpleasant side effects when celery provides only life sustaining nutrients and a natural hypertension solution? Just be sure to purchase your celery organically, since it is listed as one of the dirty dozen, which is a list of fruit and veggies that contain high levels of pesticide residues when purchased conventionally.